Residents in a McKinney subdivision were hosting an end-of-school party in their private community pool. Many teens who were not residents of the subdivision began showing up. Some had been invited by residents, some had not. An ad for the event had been placed on social media sites. Teens who were not invited began climbing the fence to get in, according to reports from residents of the area. Trouble began when they were asked to leave by residents and pool management. 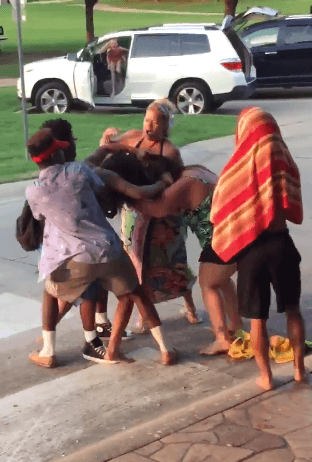 Now, at least one video (below) shows a fight that broke out between a teenage girl and two adults. Police were called to the scene and attempted to get some of the trespassers to sit down while they investigated. Many of the teens fled and police chased some of them down. This is when the video of the incident with police began. There does not appear to be any video of the initial police contact with the teens. In another post he is critical of media coverage of the incident. “I’ve never seen such irresponsible reporting and miss management of media resources in my life,” he said. Another McKinney resident, Bryan Gestner, posted on Facebook, “This was a Twitter party that turned into a mob event. Jumping pool fence. Assaulting 2 security guards, attacking a mother with three little girls. The video doesn’t show everything.” He continued saying the kids were drinking and “smoking weed” and they would not listen to any of the adults around the pool.